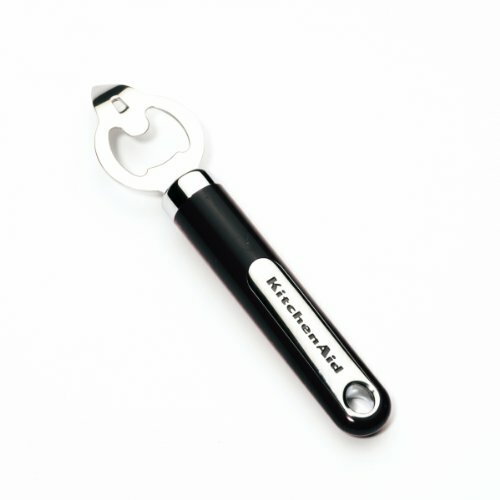 Save 1% on the KitchenAid Bottle Opener, Black by KitchenAid at Verve Wine Bar. MPN: Kit-7880. Hurry! Limited time offer. Offer valid only while supplies last. This KitchenAid Classic Bottle Opener is an essential tool for your kitchen or home bar. The bottle opener features a tough, stainless-steel head. This KitchenAid Classic Bottle Opener is an essential tool for your kitchen or home bar. The bottle opener features a tough, stainless-steel head. The opener includes a piercing tip for punching a pour hole in the top of a metal can. The opener's handle is constructed of durable ABS plastic. A loop at the end of the handle allows it to be hung for easy storage. This product is completely dishwasher safe for easy cleanup.